Different spices and herbs have different characteristics, with some having more than one virtue. 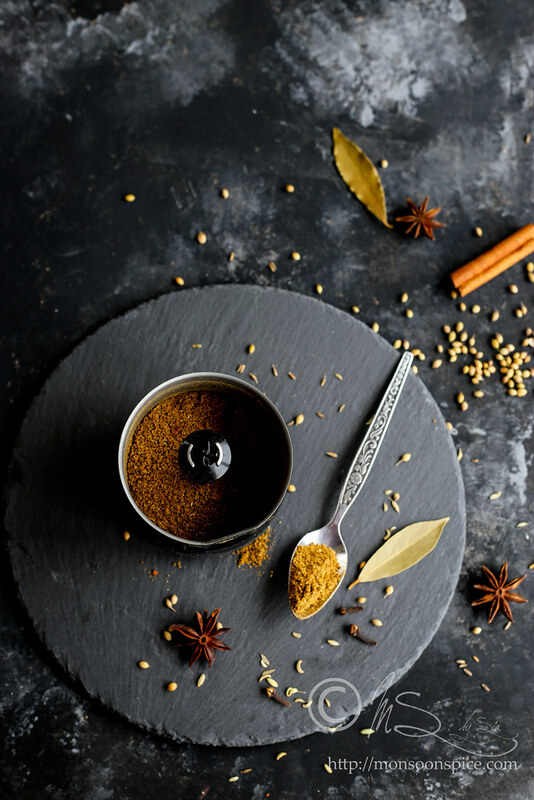 Some spices are earthy like cumin and turmeric, some are spicy such as ginger, chilli, turmeric, mustard, pepper etc which give a warming sensation and have powerful anti-inflammatory effects. 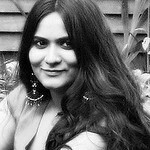 While some have floral or sweet note such as vanilla and star anise, others add colour like saffron and turmeric. The herbs like coriander and mint add burst of fresh flavours to the curry, and the ginger and garlic elevates the flavour of the final dish. 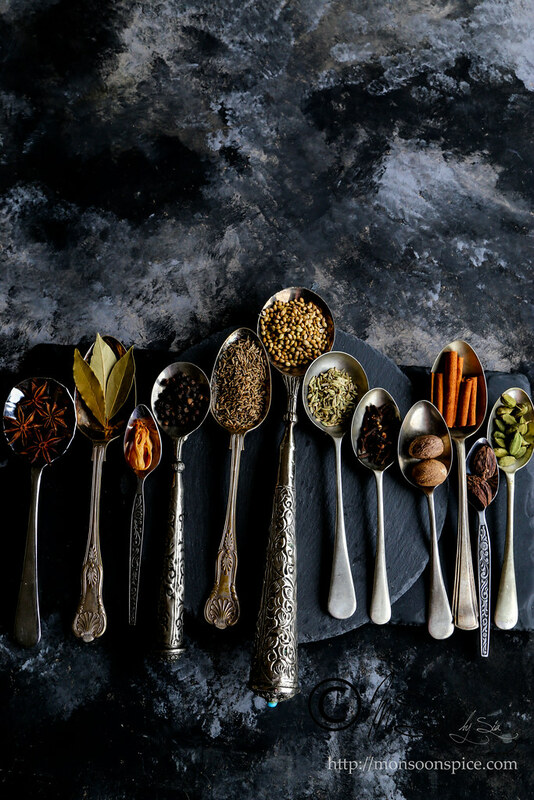 The more we explore the different flavour profiles of the spices, the better we understand their ability to make any dish more flavourful by blending them with other ingredients to make a meal tastier! To get the maximum amount of flavour of spices and herbs in any dish, it is important to use freshly ground herb and spice mix in place of using the pre-packed ones off the supermarket shelf. But is it always practical with the busy lifestyle we lead?! With so many activities packed in a day and projects and deadlines chasing my sleep for most part of the night, I wish I had more hours in a day or a clone to help me some way! But until that happens, it’s little gadgets called kitchen and home appliances which helps in my day to day running the house smoothly. There are times when I am rushing to put food on the dinner table after a busy day and last thing I want to do is spend more time chopping the vegetables and herbs, blending the curry base and pounding the spices. 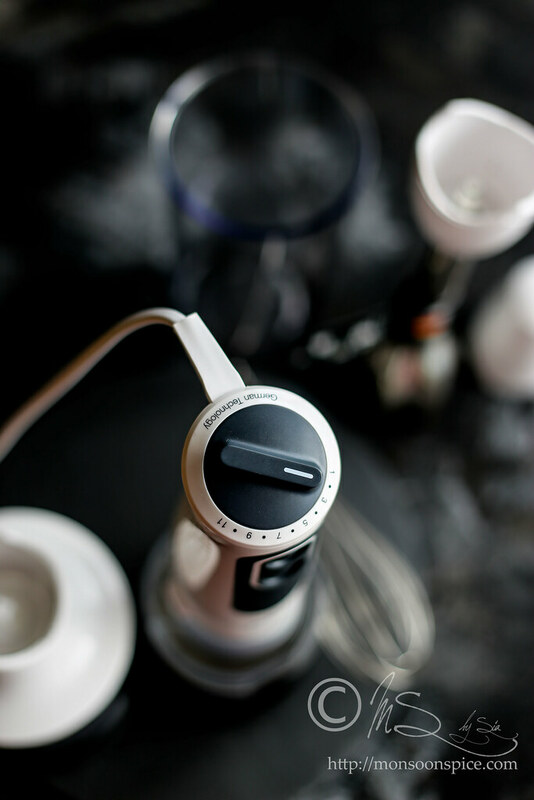 This is when my nifty gadget like Braun MultiQuick 3 Vario Hand Blender MQ 3126 WH Spice with its mini chopper, blender shaft, whisk and the new spice blender attachments comes to my rescue with its powerful 700 watts motor by quickening the prep work. Consider Indian cooking a piece of cake if you have tackled the first stage of cooking, which is prepping the ingredients as it takes the longest time in the entire cooking process. Braun MultiQuick is a versatile appliance and frankly, is the best hand blender I have owned. I have been using it daily for prepping the food from finely chopping the onions, crushing ginger and garlic to paste, blending the tomatoes and herbs into smooth purees to making a fresh batch of aromatic ground masalas for the curries and it has performed well above my expectation. Its patented PowerBell Plus technology has proven to produce fine and even blending for ideal results. Having a small kitchen with limited storage space means most of my large kitchen appliances are stored in garage at the other end of the house and I find it is quite inconvenient to bring it all the way from there when I am in the middle of cooking. With its compact design, I find this Braun hand blender most useful as it needs minimal storage space. The powerful 700 W silent and compact motor gives guaranteed reliability with performance for fastest and finest food processing results. Its variable one-hand speed wheel with 11 different speed setting means it guarantees maximum precision. We all know the precious time we lose waiting for the quintennial onion-tomato mixture to cool down before grinding to smooth paste for the base for most curries and the danger of hot paste splattering all over you and kitchen walls before it cools down to room temperature. 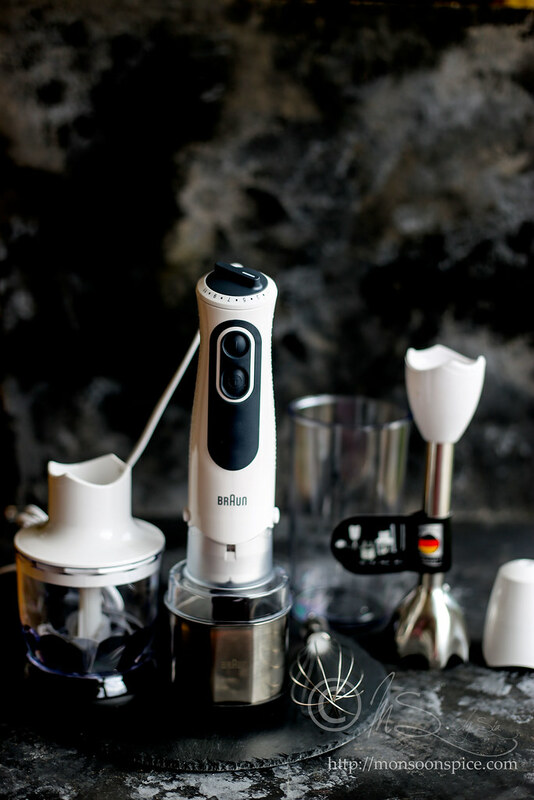 With its SPLASHControl technology, Braun hand blender prevents splashing the hot curry, soups or other hot liquids to keep you and your kitchen spotless. The product retails at 79 GBP. All parts except the motor and whisk gearbox are dishwasher safe. The chopper attachment finely chops & minces anything from meats and cheeses to onions, herbs, ginger and garlic, vegetables, nuts or dried fruits in just couple of seconds. The whisk accessory whips, beats and stirs eggs, cream with variable one hand speed with 11 speed selections and turbo option. I’ve never seen faster results for whipping cream for desserts, beating and mixing eggs for cakes or mayonnaise. And the metal blending shaft is perfect to make a smoothie or purees. The classic design of Braun's PowerBell wand makes blending a breeze whilst reducing suction and is also anti-splash. But my favourite attachment from the lot is the little spice grinder which grinds the hardest of spices to smooth powder within a minute. 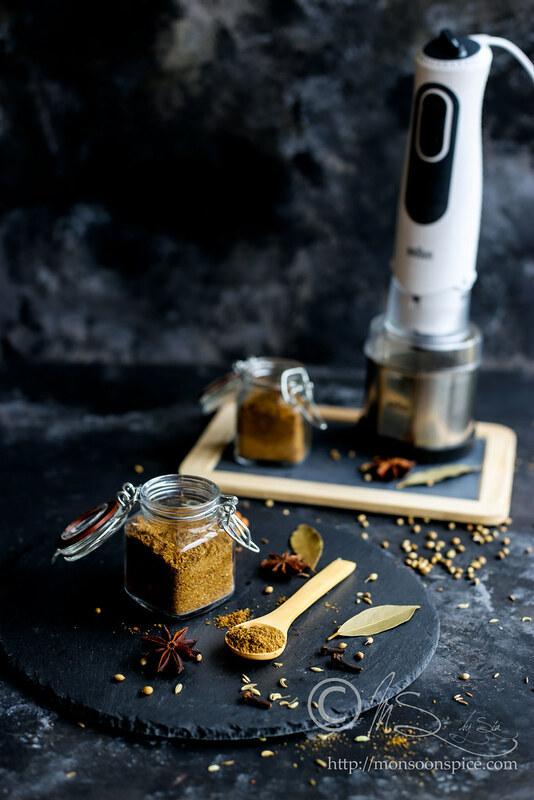 Since I prefer to make a fresh batch of spices every fortnight, this handy tool with durable and detachable stainless-steel blade and the powerful PowerBell motor makes a perfectly ground spice by retaining their essential oils and freshness. The jar can easily hold little more than a cup of whole spices and even grinds effortlessly a tbsp. of spices to fine powder. I have been making a small batch of masalas for the upcoming Diwali cooking storm and the spice grinder is constantly whirring, making one masala after another and filling our home with the aroma that screams festive season. The whole process of making a batch of masala is almost like a sacred ritual which needs patience, devotion and love. The freshest spices are picked, cleaned to remove impurities, carefully measured and individually slow roasted on low heat, stirring continuously till they were roasted and released their heady aroma that made one dizzy with excitement. One must enjoy this therapeutic process. Having right kind of tools not only simplify the process, but also enhances and retains the freshness by extending their shelf life. I am very particular about choosing the right tools whenever I make a fresh batch of ground spices, right from measuring spoons and cups to cast iron pan to roast them to my trusty old granite pestle and mortar. As much as I love pounding the spices in pestle and mortar, there are times when it is difficult to get finely powder, especially because some hard spices like cinnamon, bay leaves etc can pose a challenge. This is when a good spice grinder comes to rescue by not only speeding the process, but also getting the desired result. When it comes to Indian recipes, spices play a key role in enriching and enhancing the dish. Some recipes use as little as 2-3 spices and some call for a combination of more than two dozen spices harmoniously blended together to make a spectacular dish bursting with flavours! There is one spice blend which is used almost in daily cooking and a curry without a generous sprinkle of it feels incomplete. No, it is not ‘Curry Powder’, the yellowish, bland ground spice sold in supermarket aisles, but the aromatic Garam Masala which packs a punch. Garam Masala, which literally means warm spice, is a staple spice blend used in Indian cooking. The word masala simply means "spices," and garam means "hot." Thus the term garam masala literally translates to "hot spices." However, garam masala doesn't necessarily constitute a particularly spicy blend and it is used for its warming flavour than heat. 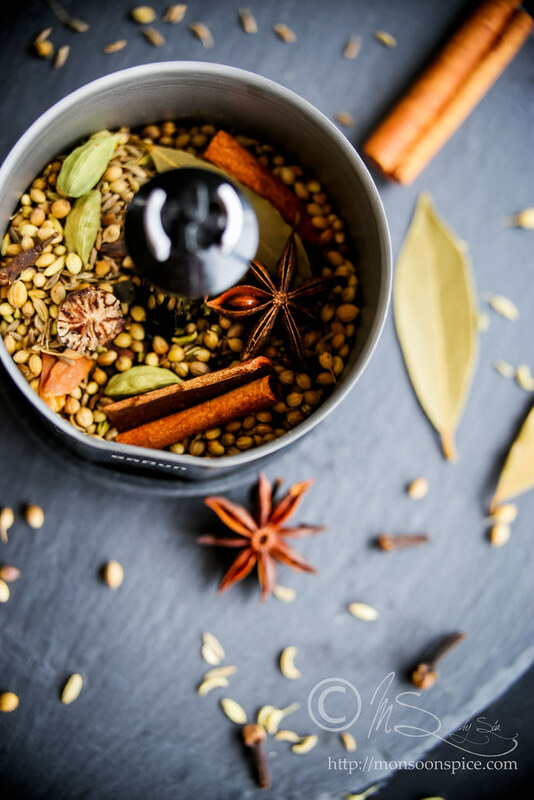 The word garam refers to "heating the body" in the Ayurvedic sense of the word, as these spices are believed to elevate body temperature in Ayurvedic medicine. The composition of garam masala vary household and regions, with many recipes across India according to regional and personal taste. In fact, there is no single garam masala recipe and none is considered more authentic than others. 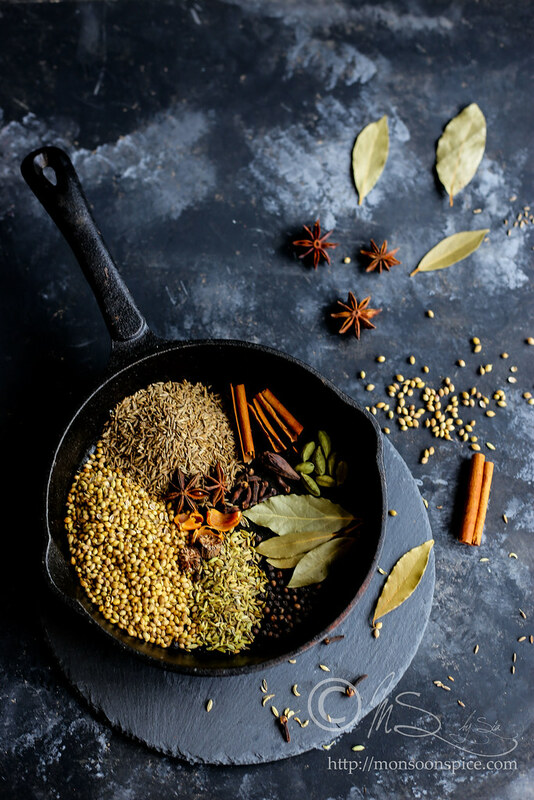 The spices used in Garam Masala can vary anywhere between 8 to 18 whole spices, though it typically includes cinnamon, cardamom, cloves, coriander, cumin, nutmeg and peppercorns. I use 12 whole aromatic spices for my version of Garam Masala which is fragrant and mild as I can always add an extra spoonful of red chilli or pepper whenever my heart desires super-hot curries. 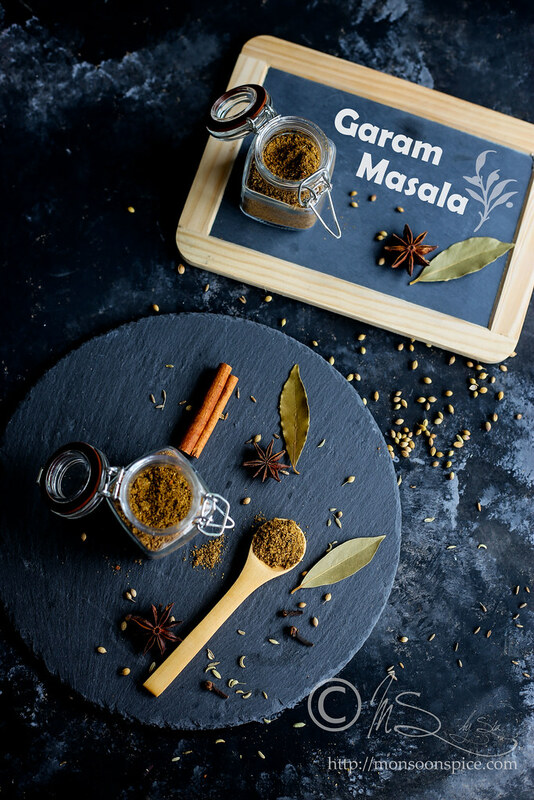 As garam masala simply means spices with varying levels of heat, you have a lot of leeway when it comes to making your own garam masala by adjusting the quantity of spices until you find the spice combination to suit your taste. Back home in India, the spices were cultivated or brought in large quantity and sun dried for few days to extend their shelf life. Then it was ground to different spice mixes for home and then to be packed and sent to other members of the family. They are invaluable ingredients, and frankly, cooking without them is unimaginable. Since sun drying is not an option, especially during this time of the year here in the UK, I slow roast the spices individually on stove top until they are fragrant. The roasted spices are then cooled down to room temperature before grinding them to fine powder. A spoonful of this fragrant masala will take the flavour to another level and much more fragrant and flavourful than anything you buy in a jar at the store. Trust me on this. You won’t be disappointed. Pick any stones or impurities from coriander seeds and cumin seeds. Wipe the insides of cinnamon to remove any dust or impurities using a lightly damped kitchen towel. Wipe clean the bay leaves with lightly damped kitchen towel. Heat heavy pan, I prefer using my trusty old cast iron skillet, on medium flame. Once hot, reduce the heat to low to medium. First roast the coriander seeds, stirring continuously to avoid over roasting or worse, prevent them from burning, over low to medium heat until they darkened slightly and give off a rich, toasty aroma, about 2-3 minutes. Transfer them into a clean, dry plate and let them cool down to room temperature. Next dry roast cumin seeds and fennel seeds similarly which takes about 1 to 1½ minutes and transfer them to a plate with roasted coriander seeds. Break the cinnamon into small pieces and dry roast them along with star anise for a minute on low flame until aromatic. Transfer them to a plate along with other dry spices. Pry open the black and green cardamoms to reveal their seeds and dry roast them for 45 seconds to 1 minute before transferring them to the plate to allow them to cool down. Dry roast mace, cloves, and black peppercorns for a minute or two until they are toasted and fragrant. Finally, dry roast the bay leaves for a minute until it crisps up and easily tears up between two fingers. Transfer them to a plate along with other spices until they cool down to room temperature. Once the spices have cooled down, transfer them to a spice grinder or pestle and mortar along with nutmeg and grind them to fine powder. Transfer the ground Garam Masala to clean, dry and sterilised jar with air tight lid and store it in a cool, dark place away from the sunlight. It will stay fresh for months. Enjoy! Apart from nutmeg, all other whole spices are dry roasted on low heat until they darken slightly and give off a rich, toasty aroma. They can take anywhere between a minute to 3 minutes depending on the spices. Make sure that the roasted spices have cooled down to room temperature before grinding them to fine powder. I was sent this Braun MultiQuick 3 Vario Hand Blender MQ 3126 WH Spice for reviewing purpose. All opinions expressed are my own and unbiased based on my experience of extensive testing the product. The photograph of the spoons is lovely! Could you please give weights for the nutmeg and mace? I don't know what "small" means here, and the mace I can get is shaved, not whole. Thank you! Thank you, Philip! It's difficult to give exact weight of the spices you have asked. By small I mean about a one and half centimeter long nutmeg and I have used one whole mace (about 4-5 strands). Indian cooking is all about 'andaz' or choosing the ingredients as per taste and it is absolutely fine if you use little more or less amount of the spices I have mentioned in the recipe. I have been looking for a good spice grinder and this looks very interesting. What was the hardest spice to grind? Did it grind the nutmeg completely? Is the amount of spice in the recipe about what would fit into the spice grinder container? 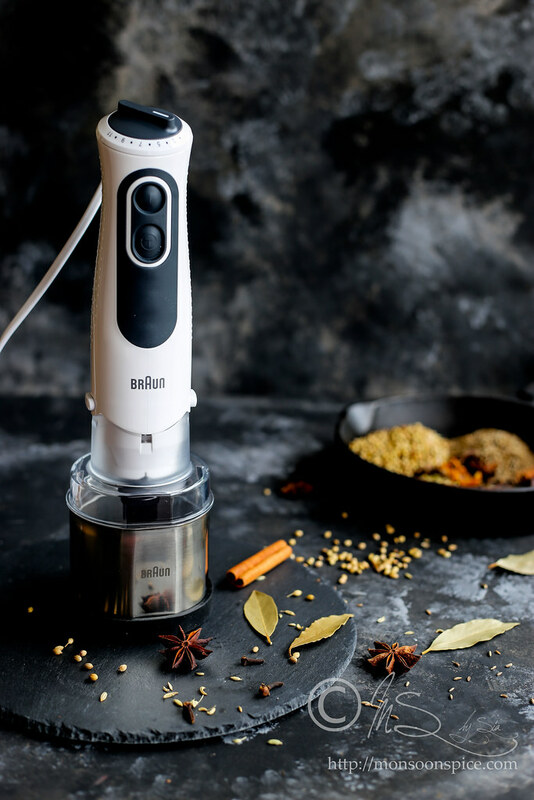 I know I have asked a lot of questions about the machine but I also want to say that your Garam Masala looks very interesting with the Star Anise and Tej Pat bay leaves. I want to try it. Hello Pamela, I find cinnamon, black cardamom, bay leaves and star anise difficult to grind, but this spice grinder really did a good job of getting fine powder. To answer your second query, yes, all the spices used in this recipe fit into the spice grinder and I would say I could top it with another table spoon of spices if needed as the jar capacity is quite good.